These works began, in part, as a solution to a problem. Some 10,000 pounds of material, the accumulated result of a decade of studio work and life, was the problem. The solution, beginning in late 2010, was to use all of that material as the basis for a series of new works. The catalogue of material was very extensive; much of it was the byproduct of other sculptural activity- casts, tests, molds, collected objects, samples, prototypes, dead ends, false starts, eBay purchases, supplies, old sculptures, etc. Also there were a lot of things which were no longer in use by anybody. I like the idea of using an earlier work to make a newer one. I also like the idea of building a body out of physical information material culture. I decided to make a large mold which would serve as a vessel. Into that mold, I would deposit the material. A water-clear, archival, UV stable resin was then poured into the mold, filling all the remaining space not occupied by any material, and resulting in a dense, solidcast transparent form. The resin serves a dual purpose. In addition to being archival itself, it also suspends the deterioration process of whatever objects are imbedded within the sculpture. Their color will not deteriorate. 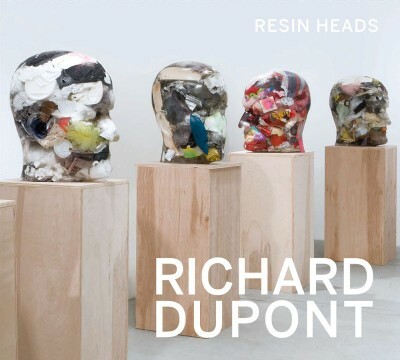 In this regard, the resin heads are a series of time capsules, but they are also about a suspension of time, material, and memory. The memories and objects used in these works are not mine alone. Much of the material is found, salvaged, collected and recycled. Collectively, they form a single idea which expands slightly with each new casting. The process is ongoing. Purchase directly from the gallery.